Published April 5, 2019 at 3:01 p.m. If a college basketball program that's won two Big East Conference Championships and one Big East Tournament Championship while posting an impressive .738 winning percentage the last three seasons can find itself at a critical crossroads, then the Marquette University women's basketball program has achieved it. Head coach Carolyn Kieger's unexpected departure for Penn State on Wednesday was a jaw-dropping development that leaves MU in potentially perilous limbo for a team ranked as high as #8 nationally this season. 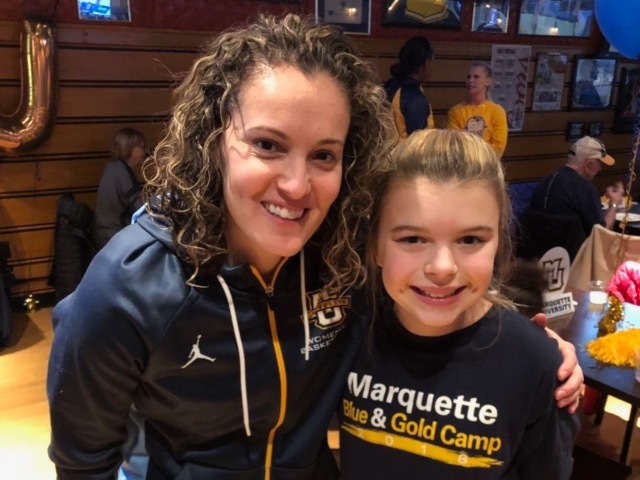 Kieger is a Marquette alum and was an outstanding point guard for Marquette in the early 2000s. Hired in 2014, she created a winning culture both on and off the court. "Leave Your Marq" was Kieger's motto for her players and herself. She was fully engaged in the Milwaukee community and planted deep roots here. I naively thought she'd coach at Marquette for 25-30 years. Obviously I'm a fan of hers and therefore was quite upset to learn she bolted for State College, Pennsylvania and the Big Ten. Boggess was Kieger's number one assistant for her entire five-year tenure. She's been MU's top recruiter and coaches the perimeter players. Her outstanding senior graduating class boasts five of Marquette's top 15 all-time scorers and two of the top three. Marquette needs stability and continuity now more than ever. The program has eight incoming freshmen, and No. 1 commit Shemera Williams has already stated that she's re-opening her options after Kieger left. I believe Ginny Boggess' hiring would solidify Williams' decision to stay in Milwaukee. If ever there was an assistant coach ready to take the helm, Boggess is it. She has 15 years experience on the sidelines with NCAA division-I programs, and Marquette would be reckless to not offer her the job and let her join Kieger at Penn State. Built in 2003, The Al is starting to show its age. Much like a hotel or restaurant, a refreshing needs to keep it current to compete with other facilities. I'd start with seeking a corporate "naming rights" sponsor who'd be willing to invest in capitol improvements. The Town Bank Al McGuire Center? The seats are outdated and uncomfortable, and the general admission bleachers above the blue reserved sections never made sense to me. Replace the entire bowl with new seat-backed chairs befitting a top 10 program. Additionally, paint the interior Marquette blue and gold. The bland creamy white towering inside walls have no personality. Liven up the place with our honored colors. Lastly, while I recognize the homage to the great Al McGuire, there is virtually no recognition of MU women's basketball – even though it is THEIR home court. Place some banners, and display the trophies, pictures and memorabilia honoring the women's teams. They deserve the recognition. I've always been miffed at the lack of support Kieger's phenomenal teams received from greater Milwaukee – but especially from the student body. Most games, the 4,000-seat arena was a third full and few students attended. I'd hire an enthusiastic marketing advocate whose sole purpose is to fill the seats by promoting the team to the campus, local sports talk radio, print media and Milwaukee at-large. MU plays an exciting brand of basketball consistently ranked as a top scoring team in the country. When I attended the sold-out Marquette/Notre Dame game (#18 vs #1 nationally) in December, 75 percent of the crowd was Notre Dame fans who bussed from South Bend. It essentially was a road game for Marquette in their own arena. Hire someone to spread the good news, Marquette! One final thought: On Sunday, March 24, I met the Marquette team bus at 11 p.m. as they arrived from Texas A&M after an excruciating loss in the NCAA Tournament. I live near campus so I walked to the Al McGuire Center just to say thank you. Carolyn Kieger hugged me as I expressed my appreciation for the joy her team brought my daughter Emma and I as fans. My parting words were, "We are Marquette!"